Luminara Unduli is an attacker with healing capabilities. Let’s look at this brief guide to determine what she does for your team. 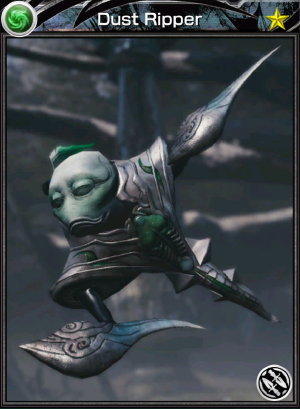 Basic Ability: Flow of the Force – Deal Physical damage to target enemy with a 35% chance to gain Evasion Up for 2 turns. Leader Skill: Elegant Steps – Jedi allies gain 14% Evasion and recover Health equal to 6% of Luminara’s Max Health at the start of each of their turns. Non-Jedi allies receive half of the Evasion bonus and Heal effect. 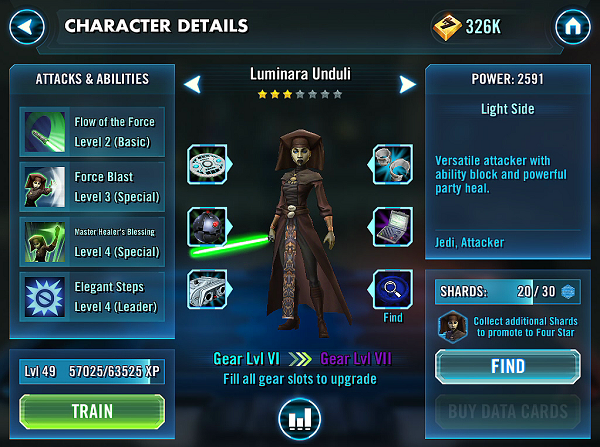 Luminara Unduli is easily the top character to get first, especially from Galactic War Shipments. If you want to get far in Galactic War(GW) consistently, her AoE heal will be a god send. The thing is, a highly geared Jedi Consular(JC) won’t be enough and you will need another good healer to keep your team members healthy and alive. Her damage improves significantly once you improve her gear, making her a threat that cannot be ignored. Her leader skill gives evasion and regen, which is also good to have in GW. With her, Talia and JC in your team, you should be able to get far in GW and even complete it depending on your opponents later on. Also, her ability block can also be a life saver for stopping a strong enemy from using a vital skill. If you want to get 10-15 shards of her a day easily, farm her immediately. You won’t regret it. She also helps tremendously in campaign maps. Her downside is that her heal gets ineffective when meeting anti-heal debuffers like Darth Sidious and Kylo Ren. Again, I can’t stress how important healers are in your progress in the game. Captain Phasma is cool, but get her after Luminara so you can farm faster. Verdict: Get her and MAX! Curious as to why her force blast seems to be the attack that is most often blocked on my team. Is it because it’s physical damage? With her force blast blocked seemingly 60% of the time in GW and arena (yes I know they have set those up with improved odds for AI controlled teams) her only real usefulness is her heal. Her normal attack that lands 90% of the time is mediocre at best.